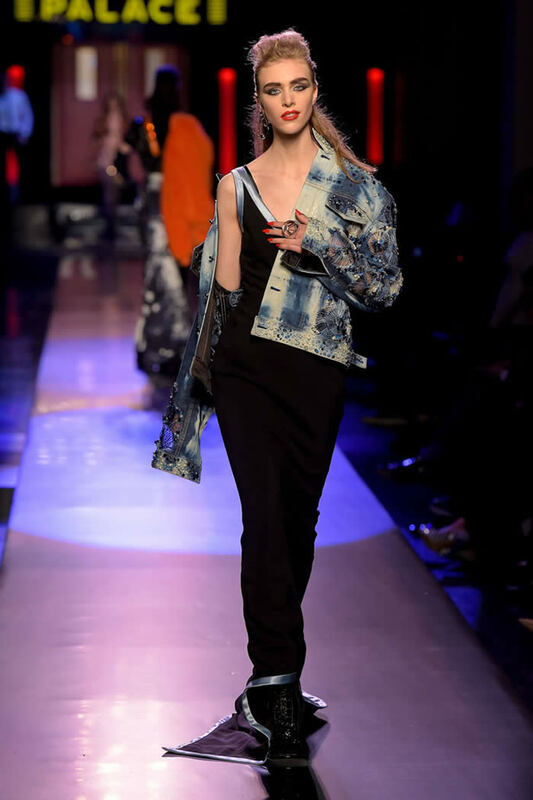 Jean Paul Gaultier’s fondness for themes has at times eclipsed his creations. His spring couture show, a celebration of the legendary Paris nightclub Le Palace, could well have been one of those occasions, but happily, it didn’t happen. The clothes were too good to be upstaged. 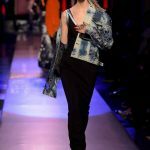 A blend of loungewear, Eighties tailoring, flashes of metallic shine and bold color, the collection evoked a heady party atmosphere, inspired by the late Edwige Belmore, the androgynous beauty known as the Queen of Punk. Belmore’s gang, including Farida Khelfa and Eva Ionesco, were guests at the display. 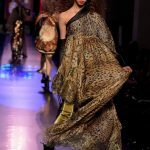 With 67 looks, it was a blockbuster affair, yet Gaultier maintained a focused approach, honing in on boudoir elements such as variations on the pajama — including a gorgeous jumpsuit with stripes entirely made of bugle beads as well as silk robes, bra tops, corset belts, and lacy slipdresses. He modernized the much-maligned ruffle, in one instance by gathering excess fabric on the front of maroon pinstriped trouser suit to soften its mannish allure, and gave bleached denim a couture feel by studding the fabric in crystals or rendering it in silk and jacquard. Models with curly manes and bright red lipstick a signature Khelfa look sashayed down the catwalk swigging Champagne and exchanging high fives, though sign of the times only one puffed on a real cigarette, with others using a prop. And although the models’ histrionics verged on irritating, you can’t blame the designer for harking back to better days. “That was a joyful time, and in less joyful times, I think you need to continue having fun,” he said. In this case, the feel-good feeling came more from the beautifully executed outfits than it did from the staging.